Very often, you have to climb up ladders to support and station platforms in order to perform control or maintenance work. We offer permanently mounted systems, which prevents you from falling. The sliding climbing protection runner “Fallbloc 2” runs along the guide (cable) and accompanies the user during upward and downward movements. 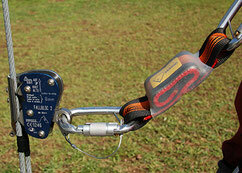 In case of a fall, it automatically locks at the permanently mounted guide (cable). 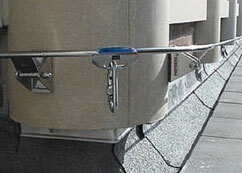 The horizontal stop device serves as a stop device on roofs, platforms, etc. and is a system with a wire cable. The user is connected through a connector between the harness and the sliding gripper on the cable. As a result, it is secured against falls.